Everything in Bulbuli’s house is made of bamboo – in fact, her house is made of bamboo too – and she even drinks hot bamboo shoot soup for breakfast. Then she goes onto her bamboo veranda to look at her bamboo grove before heading out along the bamboo path to her bamboo boat… And then she does the whole thing in reverse, winding up back in her bamboo bed at the end of the day. 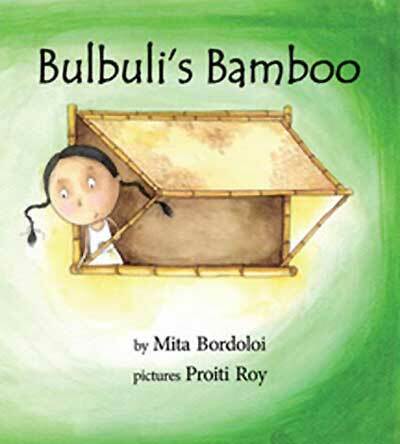 Bulbuli’s Bamboo is a sweet, simple story and the constant repetition gives it a lilt that will both amuse young readers/listeners and feed their expectations of what will come next: though they may be surprised that Bulbuli eats bamboo, and there is also a play on words when Bulbuli walks across the bamboo bridge ‘over blooming bamboo orchids’. Sure enough, the illustrations show the pink flowers of the bamboo orchid that shares its name but not its species with bamboo. Readers of What Shall I Make? will recognise Proiti Roy’s style in the illustrations – Bulbuli’s round face and the combination of solid delineation and soft, blended water-colour. I love how, although Bulbuli lives alone, the illustrations are very child-centric. Young readers will not think twice that Bulbuli’s feet don’t touch the ground when she’s seated, or that she has to stretch between the rungs of the ladder, because that is in their proportion with the world too. New, green, growing bamboo contrasts with the yellow of the dried and crafted bamboo – and through it all, Bulbuli smiles serenely, clearly happy in her bamboo world. An afterword gives some factual information about bamboo’s many uses, in language that will appeal to children. They will probably look forward to tasting bamboo shoots, if they haven’t already, and be on the look out for bamboo in its many shapes and forms around them: but at its heart this is simply a delightful story for reading aloud and sharing. Read a few pages from the book on Tulika’s website. Read a Q&A with Mita and Proiti, the book’s creators. Although the plant bamboo is technically a grass, it is often used treated like wood: and so I am including it as an honorary tree in my MWD theme Branching Across the World: Trees in Multicultural Children’s Literature! 'Branching Across the World: Trees in Multicultural Children's Literature, Bulbuli's Bamboo, children's books about trees, Mita Bordoloi, MWD book reviews, Proiti Roy, Tulika Books. Bookmark.